This problem again is asked as a coding question in one of the top companies. I have provided the solution for this in C++. Given an array of integers (unsigned integers > 0), find three numbers in that array which form the maximum product. [O(nlogn), O(n) solutions are available ]. The program expects both the solutions, one in O(n) time and the other one in O(nlogn). To achieve O(nlogn), sort the entire set by using quick sort or merge sort and take the top three values. I have provided the code for the O(n) case. It does a single scan on the entire set of elements once and finds the largest three numbers with the logic as shown below. “n” people are seated around in a circle. At each step, the “m”th person is eliminated from the circle. The next iteration continues from the person next to the eliminated person. In the end, there will be only one person remaining. Given “n” and “m”, write a program to find out the person who will be remaining at the end. Me and my roommate both implemented a solution for the above problem one in Java and the other in C++ respectively. Please see the code and the ouput for the above problem below. And the winner is D!! Lets have a look at a sample application in Swing. We load the TRIE data structure using a dictionary word list. And using the application we can perform a search. This application is a very much prototypical just to check the insert() and search() operations. There are two possible outcomes to our search criteria, one true and another false. The following is the dialog shown when a word "article" is entered. And when a word something like "dasdsa" is entered the following dialog is shown. For the Node and Trie class please click here. Now that we've seen the basic operations on how to work with a TRIE, we shall now see the space and time complexities in order to get a real feel of how good a TRIE data structure is. Lets take the two important operations INSERT and SEARCH to measure the complexity. INSERT operation first. Lets always take into account the worst case timing first and later convince ourselves of the practical timings. For every Node in the TRIE we had something called as Collection where the Collection can be either a Set or a List. If we choose Set, the order of whatever operation we perform over that will be in O(1) time, whereas if we use a LinkedList the number of comparisons at worst will be 26 (the number of alphabets). So for moving from one node to another, there will be at least 26 comparisons will be required at each step. Having these in mind, for inserting a word of length 'k' we need (k * 26) comparisons. By Applying the Big O notation it becomes O(k) which will be again O(1). Thus insert operations are performed in constant time irrespective of the length of the input string (this might look lik an understatement, but if we make the length of the input string a worst case maximum, this sentence holds true). Same holds true for the search operation as well. The search operation exactly performs the way the insert does and its order is O(k*26) = O(1). In the previous section we saw how to insert string into TRIE. In this section, we shall see how to perform a search in the TRIE when a string or key is passed. Consider the following TRIE as usual. For each character in the string, see if there is a child node with that character as the content. If that character exist, repeat step 1. Do the above steps until the end of string is reached. When end of string is reached and if the marker of the current Node is set to true, return true, else return false. Using the above algorithm, lets perform a search for the key "do". See whether "d" is present in the current node's children. Yes its present, so set the current node to child node which is having character "d". 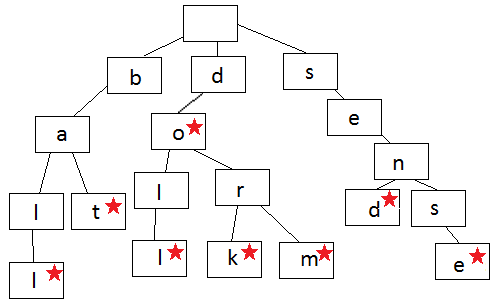 See whether "o" is present in the current node's children. Yes its present, so set the current node to child node which is having character "o". Since "o" is the end of the word, see whether marker is set to true or false. Marker is set to false which means that "do" is not registered as a word in the TRIE. So, return false. Using the same algorithm, lets perform a search for the key "ball"
See whether "b" is present in the current node's children. Yes its present, so set the current node to child node which is having character "b". See whether "a" is present in the current node's children. Yes its present, so set the current node to child node which is having character "a". See whether "l" is present in the current node's children. Yes its present, so set the current node to child node which is having character "l". The above java code does the search operation in the TRIE data structure. We shall look more into the running time and efficiency of TRIE in the next part. In this section we shall see how the insert() method on the TRIE data structure works. We shall take a specific case and analyze it with pictorial representation. Before we begin, assume we already have an existing TRIE as shown below. Lets see the steps on how to insert a word "bate". Any insertion would ideally be following the below algorithm. If the input string length is zero, then set the marker for the root node to be true. If the character is present in the child node of the current node, set the current node point to the child node. If the character is not present in the child node, then insert a new node and set the current node to that newly inserted node. Set the marker flag to true when the end character is reached. Now if you go through the already written code for this, you can have a better understanding by comparing it with the above algorithm. Now lets see how the word "bate" is getting inserted. Since the word "bate" is having length greater than zero, we can start inspecting each word. See whether "b" is present in the current node's children (which is root). Yes its present, so set the current node to the child node which is having the character "b". See whether "a" is present in the current node's children. Yes its present, so set the current node to the child node which is having the character "a". See whether "t" is present in the current node's children. Yes its present, so set the current node to the child node which is having the character "t". See whether "e" is present in the current node's children. No, its not present, so create a new node with character set to "e". Since "e" is the end of the word, set the marker flag to true. 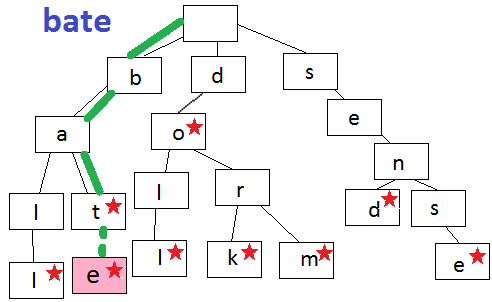 The above picture shows how the word "bate" is inserted into the existing TRIE data structure. This example clearly shows how the insertion in a TRIE happens. We shall take a look on the Search operation in the next part. In the first part of the TRIE ADT, we saw the basics of the TRIE data structure. In this section, lets get our hands dirty by directly looking at the TRIE data structure implemented in Java. We already saw the Node structure of the TRIE ADT had a content (char), a marker (boolean) and collection of child nodes (Collection of Node). It now has one more method called as subNode(char). This method takes a character as argument would return the child node of that character type should that be present. Now that we've defined our Node, lets go ahead and look at the code for the TRIE class. Fortunately, the TRIE datastructure is insanely simple to implement since it has two major methods insert() and search(). Lets look at the elementary implementation of both these methods. We shall look into the detailed working of the insert() and search() methods in separate posts, but I will tell you the gist of both those methods here. The insert() methods adds a new words to the already existing TRIE data structure. The search() method would return true or false based on whether the search string we specified exist or not. Take a quick look at the java code above because we are going to use this in the posts that follow. We shall see how to construct a basic TRIE data structure in Java. In this data-structure, each node holds a character instead of a String. 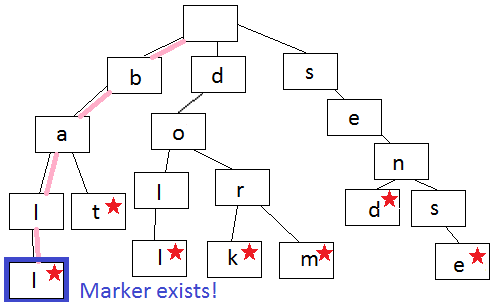 Each node has something called as 'marker' to mark the end of a word. And each node has a Collection of child nodes. This Collection can be either a Set or a List based on the speed vs space criterion. The above TRIE is constructed by inserting the words ball, bat, doll, dork, do, dorm, send, sense. 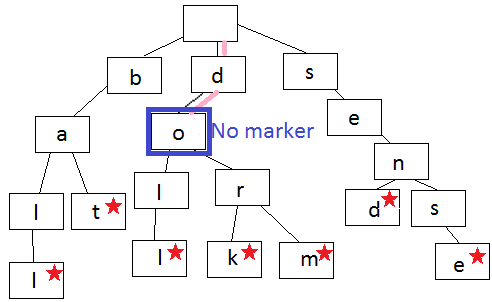 The markers are denoted on the Node using a red star(*). We shall look into more about the TRIE data structure in depth in the next post.